Software projects are getting larger and more complicated year after year stressing the need for efficient and reliable tools and agile project management methods. Widely used and recognized tools in Open Source development, CVS and Bugzilla, have been proven to be suitable for most kind of software projects and have lately been accompanied in many projects with an emerging document and content management system, Wiki. These tools are usually used separately, rarely integrated with each other to enable easier understanding and management of the whole process flow from specifications and code to releases and maintenance. Integrated tools would also provide more effective and seamless environment for software development with improved quality and productivity. This document provides a detailed configuration guide to integrate incrementally several Open Source development tools creating a seamless development enviroment without unnecessary complexity or overhead. Bugzilla/CVS/MediaWiki are all linked to each other and they together with mailing lists and various CVS utilities provide easily accessible way to see changes to documentation and source code, handling of bug reports, and people contributing to projects without any additional tools or preparations in matter of minutes whenever needed. All this is achieved by using three special magic identifiers to create references to other tools. 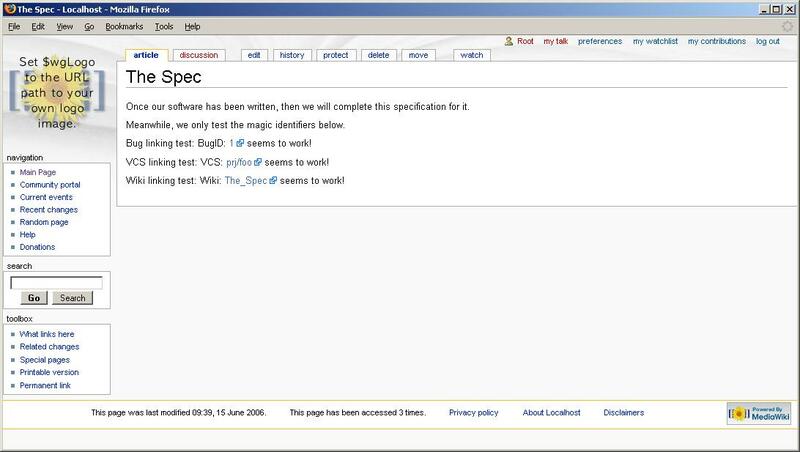 The identifier BugID: creates references to Bugzilla, VCS: creates references to version control system, CVS, and Wiki: creates references to Wiki. Whenever writing a Wiki document, a bug report, or a CVS commit message, these identifiers can be used and they are then automatically turned into hyperlinks pointing to the tools referenced. This enables smooth browsing from specifications to code, from code to bug reports, and back from bug reports to code changes and documentation. Additionally, all activities in projects are archived in mailing lists, CVS utilities provide graphical statistics, and bug reports contain references to actual changes or documentation that permitted closing the report. The instructions below proceed incrementally by configuring one tool after another until the whole environment is set up. Provided screenshots illustrate results of integration. These instructions can be used of course separately to set up only parts of the presented environment or to integrate with the tools already in use. Reader is expected to have basic knowledge about the tools and their purpose. The following instructions to configure Mailman mailing list manager are based on Red Hat packaged Mailman RPMs that have some paths different compared to official Mailman releases but otherwise the instructions can be used with any version of Mailman. It is of course necessary to run httpd and sendmail (or some other MTA) at the server where Mailman archives are located. First, Apache is configured to redirect queries to /mailman to a list info page. This setting is recommended for all Mailman installations and requires only adding one directive to the file /etc/httpd/conf.d/mailman.conf that is installed from the Mailman RPM. Obviously, you must change the hostname to match your local environment. Now the actual lists for Bugzilla and CVS can finally be created. Two lists will be used, one for archiving Bugzilla activities and one for CVS activities. For Bugzilla activities, the list shall be prj-bugs and for CVS commits prj-vcs. To create a new mailing list open the URL http://www.dom.ain/mailman/create in a browser and follow the instructions to create the list. Mandatory information that must be provided when creating a list is the name of the list, initial list owner e-mail address, and initial list password. For other settings, default values are usually suitable. Note that after creating the mailing lists the file /etc/aliases must updated as instructed in the e-mails sent to the list creator and after the update the command newaliases(1) must be run. After both the lists have been created configuration should be changed to allow anyone to post to the lists. Especially with the list prj-vcs this eases maintenance, as there is no need to duplicate changes to CVS rights in the mailing list configuration. To allow all postings to a list, visit list's admin page and go to Privacy Options->Sender Filter and change settings By default, should new list member postings be moderated? to No and Action to take for postings from non-members for which no explicit action is defined. to Accept . The last step is to enable the magic identifiers in the mailing list archives. Applying this patch and restarting the mailman service is all what is needed to enable them. The patch was generated against Mailman 2.1.5 but it should apply also against later versions in the 2.1.x series. Once done, the mailing list configuration is ready. Available screenshots: commit message in the prj-bugs list and commit message in the prj-vcs list. Both Bugzilla and MediaWiki use MySQL database to store data so before installing Bugzilla or MediaWiki, MySQL must be installed and configured. These instructions provide only quick steps to get MySQL 4 or later ready for Bugzilla and MediaWiki, for any performance optimizations or other advanced adjustments you should refer to MySQL documentation. MySQL should be installed from a package provided with your distribution. Note that before configuring MySQL the MySQL database server (mysqld) must be running. The very first configuration step after MySQL installation is to set MySQL root user password. This can be done with the following command. Note that the command will fail if the password is already set so this command can be executed more than once if in doubt. Those are the only mandatory configurations needed for Bugzilla and MediaWiki but you probably also want to configure mysqld to start during system bootup. Other MySQL configuration options can be studied from the MySQL documentation. For reference, however, few of the most useful options are also provided here for download. To apply these settings add them to the file /etc/mysql.cnf into the [mysqld] section. Bugzilla is now installed and mostly configured and can be used with a browser at the URL http://www.dom.ain/bugzilla/. Log in as administrator and go to Parameters page. There are several configuration options that could be tweaked. At least the following two options should be changed: maintainer should contain valid e-mail address of the Bugzilla installation maintainer and urlbase should contain the URL of the Bugzilla installation. There are also two seducing CVS related options: cvsroot and cvsroot_get. Unfortunately, functionality enabled by those options is of very little or no use at all; they only provide more contexts to patches attached to bug reports if the code is in the CVS repository. Certainly you may experiment with those options but it is recommended to ignore them. More information about all the options can be found from the Bugzilla documentation. After saving parameter changes, you must add two new users for integration purposes. As administrator go to administration page Users->add a new user and then create users [email protected] and [email protected]. You may want to use descriptive real names like Bugmail and VCS Commits but more importantly disable the accounts by stating their purpose in the Disable field. The accounts will be used to send bug activity e-mails to the prj-bugs mailing list and to append CVS commits log messages to bug reports. To enable automatic bug activity e-mails Default CC List must be set for each component for which the feature is wanted. Components can be found under the menu Products->Edit Product. Same account can be reused for as many components as wanted and typically all components of a product have the same CC list when used for activity e-mail generation. Example product TestProduct and its component TestComponent that are automatically created during Bugzilla installation can be used to see how the automated e-mailing works by setting Default CC List account of the TestComponent as [email protected]. 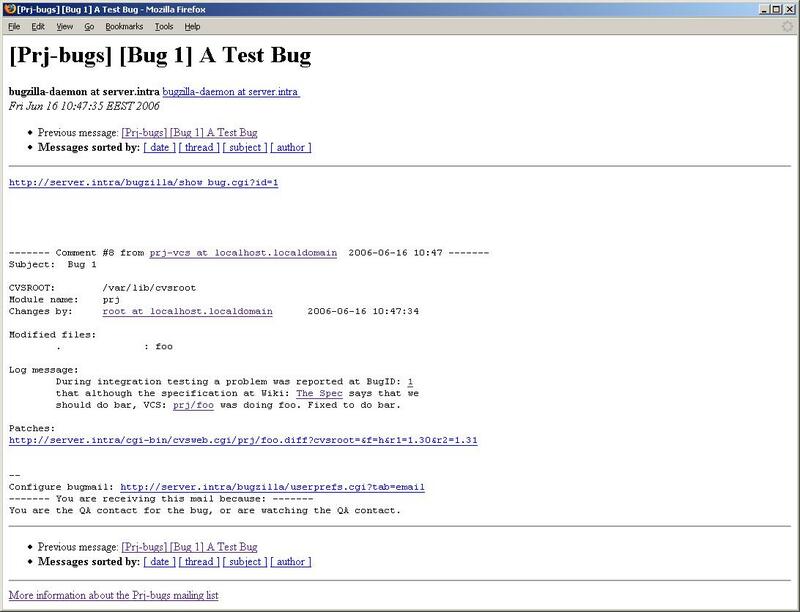 Whenever a bug is created against TestComponent or status of a TestComponent bug changes an e-mail is sent to the prj-bugs mailing list and archived. The last required step is to enable the magic identifiers in Bugzilla. Applying this patch is all what is needed to enable them. The patch was generated against Bugzilla 3.0.2 but it should apply also against later Bugzilla 3.x releases. At this stage you might want to test your Bugzilla installation a bit by creating a test bug or two against the example product TestProduct and see how linking with the magic identifiers and automated e-mails work. You may also want to adjust some other options, such as the e-mail templates and time tracking group, in the Parameters page to better suit your needs. After Bugzilla seems to be your liking, you can proceed to the next section. Available screenshots: commit message in Bugzilla. Basic set up of a CVS repository is rather straightforward task. The most important configuration setting with CVS is the environment variable CVSROOT that defines the used CVS repository. The configuration presented here uses the directory /var/lib/cvsroot as the repository and expects that all CVS users belong to the group users. More information about other settings can be found from the CVS manual. These commands set CVSROOT, create and initialize the repository and a lock directory, create files for CVS operations, and make sure the files have sane permissions. More information about these files can be found from CVS documentation but during this integration deeper knowledge about these files is not essential. Now, to start the actual integration work, CVSweb is configured and patched so that the CVS repository can be accessed with a browser and the magic identifiers are shown as links. Either install CVSweb using the official sources or use a CVSweb package available for your distribution. Then, apply two minor patches to the script cvsweb.cgi. These patches were generated against version 3.0.6 of the cvsweb.cgi script but they should apply also to other CVSweb versions. The first patch applied is to prevent error messages with new files added to the repository and the second is to enable using VCS: and Wiki: magic identifiers. In addition, some minor changes to the cvsweb.conf configuration file must be done so that CVSweb properly uses the repository created earlier and the magic identifiers are enabled. The configuration file patch was generated against the original 3.0.6 configuration file but it should apply also to other versions. There also some other changes that will be explained a bit later. For convenience, both the patched files are also available: cvsweb.cgi and cvsweb.conf. 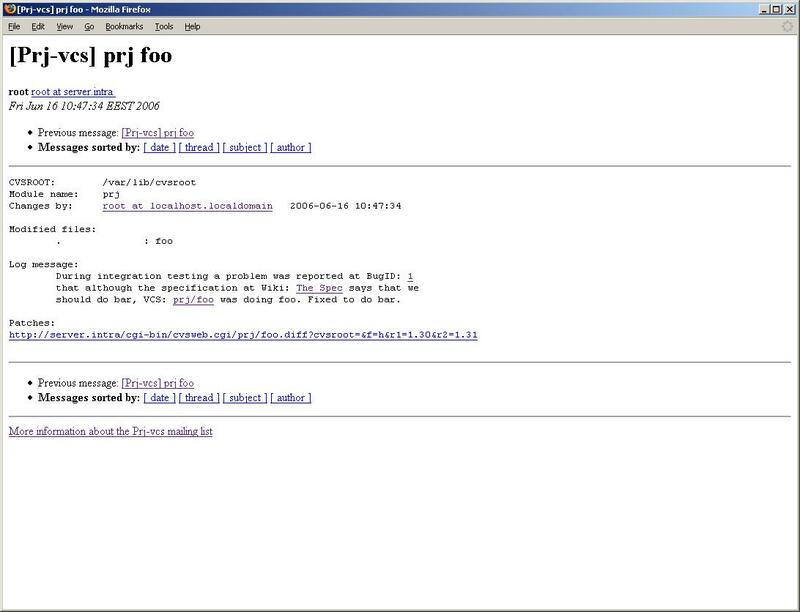 should do bar, VCS: prj/foo was doing foo. Fixed to do bar. If both the CVS repository and the CVSweb interface are working properly then it is time to begin perhaps the most difficult part of the integration. The CVS repository will be configured to send commit e-mails to the prj-vcs mailing list and to integrate with Bugzilla. All this is done by modifying the administrative files under the directory $CVSROOT/CVSROOT and using some integration scripts. Since there are many interdependencies between the files it is probably best to do all required changes at a go, then test the changes, and fix any problems that might arise. checkoutlist simply lists additional files that should be treated as CVS administrative files in addition to the standard administrative files. rcsinfo and rcstemplate are used to add a help text that is shown when writing a commit message. cvswrappers simply lists file types that should be handled as binary files. users is used when automatically generating changelogs as explained in the next section. It does not harm to add it even without real content. The following files, originally used in projects at sourceware.org, are in the heart of the integration and may require a bit more attention to understand them completely. However, deeper knowledge is not necessarily required since all the files contain a short configuration section that needs to be adjusted only to match your local settings; the actual code should require no changes at all. commitinfo defines a command to be executed before commits. commit_prep is defined and it just records the last directory with commits for use by log_accum_bugzillafied. loginfo defines a command to be executed after the commits. The script log_accum_bugzillafied is defined and it sends commit e-mails to specified addresses. Note that the script log_accum_bugzillafied itself does not yet add data to Bugzilla database, it will be done by the script processing the commit e-mail sent to Bugzilla. Of these scripts, log_accum_bugzillafied and loginfo need most adjusting as they contain e-mail addresses, URLs, and other settings that are always project specific. Nevertheless, the required changes should be rather obvious after some inspection. Since the script log_accum_bugzillafied sends the commit messages as e-mails, they must be received and processed properly. The processing is done by the script email_in.pl that is part of the Bugzilla installation. The script must be slightly patched to enable it to find all required Perl modules. The following line must be added to the file /etc/aliases to automatically invoke the script when sendmail receives commit e-mails. Note that the recipient must match to the one defined in the script log_accum_bugzillafied. And, once again, the command newaliases(1) must be run after the alias database has been updated. After the update, sendmail executes the script for all e-mails sent to the address bugzilla. However, by default sendmail is not allowed to run random commands while processing e-mails so the script must be listed as an allowed command. Also the permissions in the Bugzilla installation must be changed so that the user mail under which sendmail is running is allowed to read and execute all the needed scripts. The following commands allow sendmail to invoke the script email_in.pl and change permissions so that the user mail is actually able to run it. It must be noted that running again the script checksetup.pl or editing Bugzilla parameters will change the file permissions so that they must be adjusted again. However, as these are rather rare events it does not cause too much maintenance burden but this is well worth keeping in mind in case of any integration issues. After all these changes, you can finally commit the modifications in CVSROOT directory. Before actually testing the integration, please make sure that all Perl modules required by email_in.pl have been installed. This can be verified by running the script from the command line. If any error messages are printed, some modules, such as MIME-tools, are probably missing. If no errors are printed, the Bugzilla/CVS integration is complete! You may now experiment with commits containing the magic identifiers and see how the commit messages are appended to bug reports alongside with hyperlinks to actual changes in CVS. If everything seems to be working you are ready to proceed to the next section. But be assured, the rest will be a pleasure cruise compared to the struggle you have been through so far. Available screenshots: commit message in repository web interface. This section provides quick instructions on how to use some rather useful utilities to generate statistics from your CVS repository. Although they are not absolutely required from the integration point of view, they all fall into the low-hanging fruit category and are thus worth configuring. CvsGraph is a utility to make graphical representations of CVS repository. It is integrated with CVSweb and it very likely can be found from your distribution's package collection. Compiling it from source should also be trivial, after compilation just install the cvsgraph binary in a directory contained in PATH. Configuration is simple and can be done by copying this file as /etc/cvsgraph.conf. See CvsGraph pages for more information about CvsGraph and example graphics. 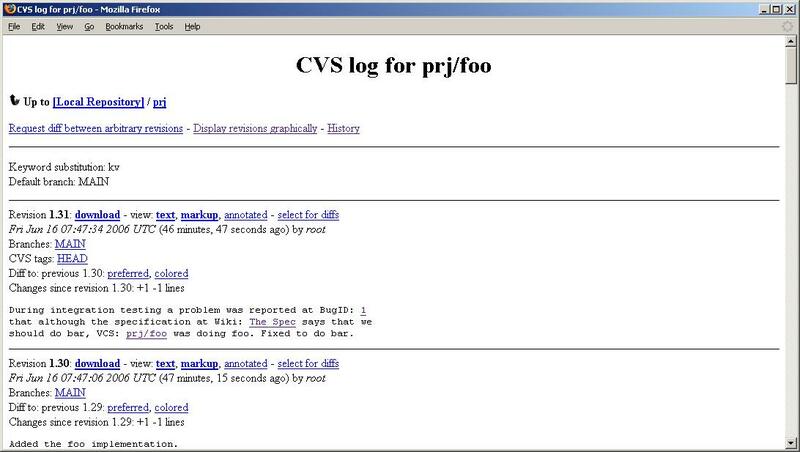 CVSHistory is a utility written in Python that is used to track development activity on CVS using software projects. It is integrated with CVSweb and its installation is simply done by copying the script cvshistory.cgi from the CVSHistory package to your web server's CGI directory, usually /var/www/cgi-bin. Then set the CONFIGFILE location in the script as /etc/cvshistory.conf and copy this configuration file as /etc/cvshistory.conf. That is all needed for installation, a History link is now present in the CVSweb interface that allows easy activity tracking. See CVSHistory homepage for more information about CVSHistory. cvs2cl and cl2html are Perl scripts used to generate formatted changelogs based on CVS activities. Installation is simply done by placing the scripts in a directory contained in PATH, e.g., /usr/local/bin. There are several command line parameters that could be used but for convenience a shell script is provided that creates GNU/HTML/XML formatted changelogs from the CVS repository and also a nice web page to access them. Please refer to the documentation of the scripts for more information about their usage. Note that the shell script requires the file $CVSROOT/CVSROOT/users to be created and if it contains valid mappings for names those are used when generating the changelogs. As can be seen from the script the statictics web page created by default is /prj-cvs-stats/index.html. StatCVS is a tool written in Java that is used to create exhaustive amount of statistics from projects in a CVS repository. Installation is simply done by placing the JAR file from the StatCVS package to a proper directory, e.g., /usr/local/share and running it with the help of java(1) command. There are several command line parameters that could be used but for convenience the previously provided shell script also contains needed commands to create StatCVS statistics that also contain links to the CVSweb interface. Please refer to StatCVS documentation for more information about its usage and example statistics. Other related CVS utilities that might be mentioned here are LXR, a general purpose source code indexer and cross-referencer, and Bonsai, a tool that lets one to perform queries on the contents of a CVS archive. Available screenshots: links to statistics generated from the repository. 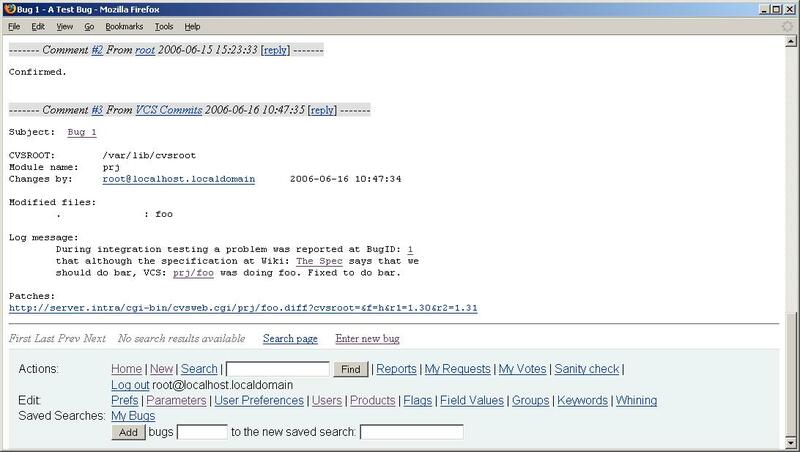 MediaWiki configuration is then done with a browser simply by opening the URL http://www.dom.ain/wiki/ and answering to configuration queries. Sufficient help for most queries is available at the configuration page so most of the items are not covered here. Shared memory caching would provide performance speedup but in this basic configuration, no caching is available. For all e-mail related queries you should answer depending on your own needs. Since MediaWiki automatically maintains history of recent changes and also provides them as an RSS feed so e-mailing them to a mailing list would not be very useful. Finally, in the Database config section the provided default values are suitable. For the field DB password use a proper password that is different from the MySQL root password that was set during MySQL installation. The previously set MySQL root password must then be entered into the field Superuser password . Note that you must also set the option Use superuser accounts . For Database charset it is recommended to select Backward-compatible UTF-8 . MediaWiki is now installed and configured. To allow usage of the magic identifiers also in Wiki you need only to apply this patch. The patch was generated againt MediaWiki version 1.11.0 but it should apply also against later versions in the 1.11.x series. After applying the patch to the installed MediaWiki the magic identifiers turn into hyperlinks. Now, after all your hard work, the integration should be finally completed, congratulations! Bugzilla/CVS/MediaWiki are all linked to each other and they together with the mailing lists and various CVS utilities provide easily accessible way to see how projects have evolved and improved. Changes to documentation and source code, handling of change requests and people involved in the project can be found out without any additional tools or preparations in matter of minutes whenever needed. Available screenshots: magic identifiers in a Wiki page. This document provided a detailed guide to integrate Bugzilla, CVS, MediaWiki, several CVS utilities, and mailing lists together. After integration, these standard tools provide an effective and seamless software configuration management (SCM) environment for professional software development allowing developers and managers to keep on track of projects and quality issues. Environment where everything from specifications and code to bug reports and code modifications are all integrated and easily accessible improves tremendously both quality and productivity of a project. Environment could be further enhanced with other tools such as a source tree monitoring system, a test case management system, a code review system, an integrated IDE, and other similar features. In a corporate environment, access restrictions and more sophisticated user management methods might also be needed. These kinds of configurations are, however, outside of scope of this document. All the configuration files mentioned are browsable and available for download. Comments and feedback can be sent to oss(at)segetech.com. We would kindly like to note that we cannot promise a personal reply to all e-mails received, especially to those asking for help in some unrelated configuration problems. Inquiries about possible cooperation should be done via addresses listed at our Contact page. This document was last updated on 2007-11-13.